Here are some rave reviews from the amazing people I've had the pleasure of working with! "Dani is without a doubt, the best boss I've ever had the pleasure to work with. She is an incredible mentor and advocate who always championed my career at Salesforce. She's also the exact right mix of hands-on when I needed support with a tricky project issue/escalation, but allowed me the space I needed to own my own process and projects. She's absolutely phenomenal." "Since Dani joined the digital PM team I've been extremely impressed with her ability to dive in, understand the multiple moving parts and roles our projects take, and be effective in driving them forward. One of the strongest qualities Dani possess is her proactivity towards ensuring everyone is aware of the project status, the next steps, and that individual teams know what is coming down the line. Since Dani has joined I felt that our digital team has been more organized and collaborative. Dani is easy to do business with and is able to adapt and pivot in our fast paced environment. She's always calm and collected, even when things go south or there is an executive fire drill. I've been grateful for what Dani has brought to the team, and I think her leadership and style of Program Management is something that others on the team could learn from." "Great team leadership, VERY calm under pressure. Can make the complex, simple." "Dani is one of the smartest and hardworking people I've had the pleasure of working with. She's not only a killer project producer, jugging multiple programs of various complexity and scope, but she's also a strategic marketer and visual thinker. She's turned many whiteboard scribbles and roundabout conversations into actionable plans and beautiful presentations. During our time together, we defined our process, tools, and developed training materials to help scale the team and business as it tripled in size in less than a year. In short, Dani knows what she wants, can explain why, and flawlessly executes. I highly recommend her as a valuable addition to any workplace." "Danielle is a rare find--not just organized, but also creative and strategic. I've had the good fortune of working with her on a number of projects over the past year, and am impressed not just by her ideas, but her agility in turning them into something useful. When Comrade began to deepen our focus on digital health, Danielle swiftly produced three thought pieces to help us articulate our point of view. Beyond bringing her personal passion for fitness to this work, she demonstrated a genuine compassion for people. I'm glad to have someone so smart and dedicated as a colleague." "It was a pleasure to work together with Danielle, who was an efficient Strategic Project Manager. She thinks on the cutting edge of social media, brand marketing and team leadership. Danielle led by example and improved processes and procedures to the benefit of everyone in our company. I would recommend her if you need the very best in project management execution. Danielle had vision to see the benefits and the passion to turn her work at Thismoment that into measurable results for her customers." "Danielle is the best kind of project manager to work with as a developer. She is adept at reconciling client needs with development resources, providing air cover for her devs without sacrificing timelines or quality of work. She is a calming presence in the face of panicking clients and a friendly face for a stressed team. She is flexible and personable, detail oriented and level-headed." "Danielle is an extremely talented, detail oriented and focused individual. She has the unique ability to manage complex projects and planning with ease and with an great attitude! Her ability to keep calm under the most stressful situations while maintaining a clear objective of the goals made her an extraordinary person to work with. I have no doubt she will make a great addition to any company and I would gladly work with her in the future." "I love Danielle - smart, savvy, diligent and curious, she's a great person to work with and also a great friend. A winning combination! I worked with Danielle at Eveo where we both rose through the ranks in our areas of interest. By the time I made the move to leave she was reporting to Eveo's CEO and directly involved in critical strategy decisions for the company. Because she is a solid project manager first, Danielle was able to take her strategic thinking and build a structure and implementation plan to bring her ideas to fruition. It's rare to work with people who are the full package - so it was a complete delight to work with Danielle. I would offer the highest recommendation to anyone considering her for their team." "Danielle was the kind of manager who knew how to balance being a leader along with the knowledge of the company and product. Her focus was always on the process of the project/end result without losing the importance of relationship building. Danielle brings a wealth of knowledge of the field she works in as well as an appreciation for employees. Although we didn't work directly together, I was encouraged to ask for mentorship and advice from her and she responded tenfold. As a mentor, Danielle taught me the kind of skills that continue to assist me as a Web Project Manager today. I would work with Danielle again in any company and highly recommend her for any position." "I managed Danielle for 2 years and during that time she directly contributed to the revenue growth of our sales team by producing custom minisites and promotions with 3rd party vendors. For these projects she led the execution, copy and design process, analyzed and presented various web traffic reports using Omniture Report, and made recommendations to increase campaign traffic. She also managed the scheduling, production process and delivery of multiple, concurrent campaigns while bringing them in on time and on budget. I could always count on Danielle to identify areas of process improvement and pro-actively offer effective solutions. She is a dedicated employee with a rare combination of tech skills and creative sensibility"
"I am pleased to write this recommendation for Danielle. Danielle worked in a support role in developing solutions for my clients. She was a pleasure to work with and you always knew that the end result would be well thought out and on the mark. Danielle took the time to understand the context of the work and the individual client's needs, asked intelligent insightful questions at the outset, and delivered her work as promised, on schedule and reflecting highly polished and professional results. She would typically also include recommendations for improvement that were above and beyond what I had asked for. She is articulate and thoughtful and a great presence in any client meeting. I am pleased to give her my highest recommendation." "Danielle is very detail oriented and does an excellent job at keeping track of tasks in order to get the overall project accomplished on time. In addition, she has a keen understanding of technology which seems to be almost instinctive. She quickly develops solid relationships with stakeholders at all levels and has a healthy curiosity for understanding the broader initiative beyond what she is directly involved in at the time." "Danielle is an organized, detail oriented project manager who readily took on responsibilities and was able to improve processes, act autonomously and with minimal direction. She is a pleasure to work with, very directed and make things happen." "Danielle was an integral part of an integrated team that produced a successful, corporate level multi-year initiative on WebMD. As the project manager on the client side, Danielle was diligent in keeping the project on track, meticulous in providing notes, direction and follow up tasks for all involved, and very creative in offering ideas, insight and solutions. She works comfortably with all levels of management. I highly recommend Danielle." Here's A sampling of MY RECENT WORK. As a Senior Program Manager at Salesforce, I partnered with a cross-functional team to manage initiatives for salesforce.com. In addition to managing the website projects, I facilitated and coached the project management team to promote alignment on projects to ensure work flows seamlessly from initiation to completion, partnered with senior leaders across departments to develop strategic implementation plans, document department needs and optimize processes, and directly managed Digital project managers to drive the execution of marketing initiatives on salesforce.com. I lead the creation of a unified process site for the Marketing organization to help drive understanding around how to engage with the Creative and Digital marketing teams. The site included crucial training materials for systems/tools, governance on how we define and prioritize work and common workflows for frequently requested work to help ensure that project work flows seamlessly between disciplines. Feedback on the site was overwhelmingly positive, with the reach now expanding to the regional teams as they are looking to innovate their business practices. Additionally, I created a systemized approach for new teams and regions to adopt Marketing Requests and Mavenlink (program management tools). The materials created included briefing documents to help gain excitement around how these tools will transform their business, along with templatized worksheets to simplify their onboarding process. I led conversations with key stakeholders to the adoption and rollout from initiation to completion across multiple teams and regions. Lastly, I was instrumental in developing the strategy and implementation plan for how Creative and Digital projects are made visible within the Marketing organization. I partnered with senior leadership to create a variety of reports to show health of business, project status, resource capacity, etc. These reports have been extremely well received by the Marketing CMO and have enhanced the transparency of work across teams. As the Associate Director, Project Management I worked directly with my SVP to build 30+ person multi-disciplinary team in Nashville TN and Atlanta GA responsible for migrating the USA Nissan and Infiniti websites onto Adobe Experience Manager. The scope of the migration included over 1,000 pages, 3 languages, 3 brands, 8 integrations and over 138 customer features. I sat directly in the Nissan/Infiniti client’s PMO and was responsible for managing risks and the overall health of the program. My core responsibilities were directly managing the project management team, designing ways of working between our regional teams and clients, creating mechanisms to report on status and risks, defining escalation paths and implementing an agile working methodology. 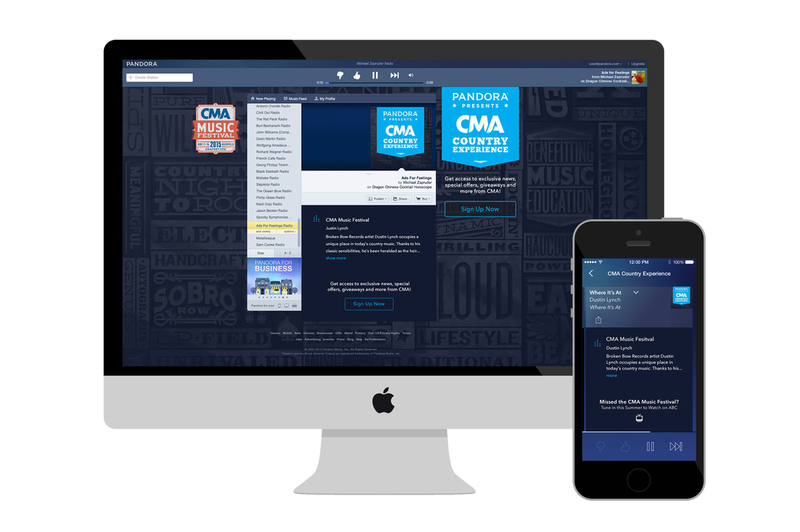 As a Senior Digital Producer at Pandora, I partnered with our artist relations team and the Country Music Association to develop a custom station on Pandora. The CMA Country Experience station was created to celebrate the spirit of Nashville with a collection of custom mixtapes and artist interviews. This compilation provided listeners an insider peek at some of the CMA’s biggest events of the year (i.e. CMA Music Festival, CMA Awards and CMA Country Christmas Special). Each event coincided with a station refresh and custom artist content. Throughout out the project, I was responsible for coordinating efforts between internal stakeholders, clients and artists to capture the content required for the station. Additionally, I managed the station's development team to build and test the listener experience. The project was successful and engagement yielded the station 285k unique listeners, 136k+ hours of listening time and 28 minutes of average listening per user. From early planning phases to project completion, I provided user experience design, content development and thought leadership. As a Senior Digital Producer at Pandora, I partnered with our marketing team to create the first ever paid media campaign for Pandora. Pandora Thumb Moments brought personalization to a whole new level by literally bringing fans face-to-face with artists they love. This transpired all because they "thumbed up" a song on Pandora. Initially we handpicked a few select artists, Fall Out Boy, Lindsey Stirling, Matt Nathanson and Nick Jonas, to instantly engage listeners who gave them a "thumbs up" on Pandora to thank them for being a fan. If a listener was selected, the artist immediately sent a request to invite him or her to engage in a live studio experience. We then produced those experiences on video to promote both on and off platform. Each artist also curated an exclusive, personal Mixtape that lived on the Thumb Moments station. As the lead producer on this program, I led the development and product team in solutioning a method that allowed a custom station ad to be served when a listener "thumbed up" a song by the selected artist we had in studio. In addition to managing the technical development, I also coordinated production on set and conducted artist interviews for most of the talent on the custom Pandora station. As a Senior Project Manager at Comrade, I partnered with Bank of the West on an ambitious effort to redesign their user experience for their core online banking platform. I managed a team of comrades that collaborated as an extension of the Bank of the West Multi-Channel Banking team in addition to the user experience resources at Bank of the West. Throughout out the project, I was responsible for coordinating efforts between business stakeholders, an off-site development team and both user experience teams. It was challenging to manage such a large team in various locations. Daily scrum meetings, online chat and video conferencing helped keep the teams in sync. 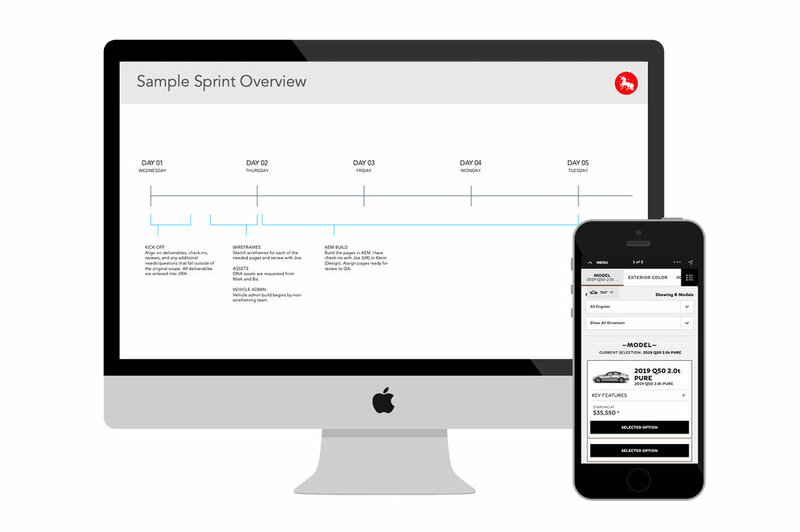 I also helped coordinate the efforts to move people into sprint teams, which allowed for a more focused effort across the 30+ functional groups we were updating. From the early planning phases through strategy, design and execution, I have helped provided leadership and support to ensure Bank of the West delivers the a strong user experience to their customers. This is an on-going project that is set to launch in 2015. At Comrade, I also partnered with iHealth to help transform their digital experience. I managed a small team of Comrades to redesign ihealth.com to have a modern and responsive design. I conducted multiple working sessions with the iHealth team and fellow comrades to help focus our efforts. The outcome of these sessions were a defined visual style tile / mood boards, user experience strategy and a new messaging platform. From these outcomes, I managed the selection of a responsive WordPress template, wireframes and site map development and visual design creation. Once we were in the visual design phase, we came across an issue with the provided iHealth photography assets, they did not meet our new visual tone. I worked with the internal team to scope an inexpensive photo shoot using internal Comrade resources to solve this problem. In addition to managing the project, I was a pinch hitter for the design team and help design the iHealth online store assets. I also was one of the models for the photo shoot. That's right, I'm going to be famous. This is also an on-going project that is set to launch later this year. I managed and successfully launched Disney Let the Memories Begin website across Facebook, YouTube and disneymemories.com. Post launch, I saw an opportunity for to add an additional distribution point. So, I single handedly scoped, wireframed, designed and managed the development for the mobile version of the site. The client was so pleased they renewed their hosting contract for an additional 2 years. As a Senior Project Manager at Thismoment, I launched over 52 projects the worlds top brands between 2012 and 2013. While I was a project manager at Thismoment, I worked on the Levi's 501 account. I coordinated efforts between the client's development team and the Thismoment API team to launch levis501.com. This project was similar to the aforementioned Disney Parks campaign because it was collecting user photo's of 501 jeans. Instead of using the Thismoment UGC engine, we used APIs to pull in Instagram and Twitter posts using #levis501 and #501s. At the time, this was dangerous grounds because Instagram and Twitter's photography ownership policies were vague. I had to work with Levi's legal team to ensure we were not breaking any guidelines. In addition to managing the project, I helped train the client on how to use the customized CMS by providing training sessions and customized training materials. As Director of Strategic Planning at Eveo, I managed, wireframed and provided creative direction on multiple winning pitch projects, resulting in 11 new accounts and over $3M in sales. I also implemented a system to analyze profitability of pitches over time against profitability of projects. During my time in this role, I was able to edited and streamline capabilities presentations to better position our products against competitors. During my time as a Project Manager at Eveo, I worked as the program manager on Reclast (Eveo's first Agency of Record client). I was responsible for managing studio project managers to ensure print, interactive and video programs aligned in both creative and content. I also managed the creation of the materials for the yearly Reclast National Sales Meeting. I worked directly with the client to draft scripts and presentation materials for the meeting. In a matter of 4 weeks, we were able to pull together an award winning trailer video and 3 variations of the sales presentation. It was a race to the finish to get compliance approval before the meetings. I ended up traveling with the client to ensure the materials stayed up-to-date since changes we coming in hours before the meetings. The Reclast National Sales Meeting Trailer video won a 2010 Telly Film/Video Broze award. In addition to the Reclast work, I was responsible for managing projects for other Novartis accounts. A handful of the projects I worked on won best-in-class awards. When I had bandwith, I jumped in and assisted in the development and defining of user requirements for Eveo's first proprietary patient, physician and sales iPhone and iPad applications. I was also responsible for drafting training and on-boarding new project and account management hires. In my role as a Sales Marketing Producer at iVillage / YourTotalHealth, I managed the iGo Green sweepstakes to promote the launch of iVillage's new web portal, iGo Green. I was able to leverage multiple promotional channels across the NBC Universal web properties to foster brand awareness, user interaction and return visits resulting in over 58K unique visitors, a 12% return rate and over 1.3MM page views. During the sweepstakes, I saw an opportunity for improvement, so I worked with development resources to create a short form entry method. This enabled returning users to enter their information more quickly, this resulting in high sweepstakes entry rates. For the iGo Green sweepstakes, there was a 10% increase in return entries from the period where the long-form entry was available and when the new short-form entry launched. The SEO campaign that I managed for 1on1health.com helped increase site traffic from 250,000 to 480,000 yearly visitors. In addition the work the team did on 1on1health assisted in increasing GlaxoSmithKline sales representatives' time with physicians. The patient friendly content within the 1on1health print booklets (English, Spanish and Chinese) increased call time by 2.4 minutes (1.4 minutes on GlaxoSmithKline product and 1 minute on 1on1health).